Tonight the Board had a good discussion on the Superintendent’s proposal to modify our A-G graduation requirements to address concerns that students in our Court/County or Continuation schools will not achieve a diploma under the new, more rigorous requirements. Longtime readers of this blog will recall that in 2009, the Board voted unanimously to change the district’s graduation requirements, starting with the class of 2014, to align with the entry requirements for the UC/CSU system — known as the A-G course sequence. The very good news is that 91 percent of the class is either fully on track, or on on track in credits but missing one or more required classes (Algebra 2 in many cases, or a semester of P.E., or for English Learners, a required additional English course). Currently, 920 students at comprehensive high schools (e.g., Lowell, Washington, Lincoln, Balboa, etc) or continuation high schools (Ida B. Wells or Downtown) are OK with credits but missing a course, and that situation is fixable. Counselors have already met with each of these students and their families, and developed individual plans to make sure these students can make up the necessary courses and graduate on time or over the summer. 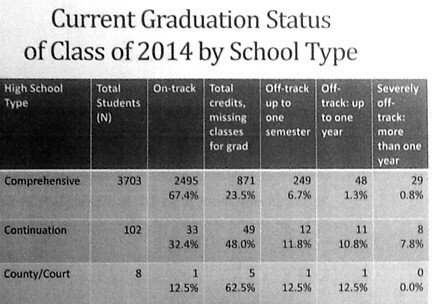 The bad news is that as you can see above, 262 are at least a semester off track, and 97 are severely off track — more than a year behind. Still, even as recently as last spring, the Board and staff thought we might be looking at numbers that are much worse. Essentially, the Superintendent’s proposal would allow students in County/Court or continuation schools to graduate with 220 rather than 230 credits, and waive one year of world language as well as the requirement for Algebra 2. Commissioners had a lot of issues with that recommendation tonight, noting that a good number of our students in these schools — despite being our most disadvantaged in many cases — have managed to meet the requirements up to now. The counter argument is that under the current policy, there are a lot of students in the class of 2014 who would qualify for a diploma under the previous requirements (which didn’t include Algebra 2, for example) but not under the new A-G requirements. San Francisco USD is unique because it is both a county system and a unified school district — no other district in the state has that dual role. And so we are also the only county school system that is currently requiring all students to graduate having passed the A-G course sequence. Other unified school districts require A-G for graduation — San Jose, Los Angeles, Oakland and San Diego, to name a few — but they also can refer students to separate county systems with less rigorous graduation requirements. Under our current policy, San Francisco does not have that “loophole” or “escape valve” (what you call it depends on your point of view). Based on tonight’s discussion, it appears that the Board would rather see a one-year waiver of the requirements for members of the class of 2014 who attend Court/County or continuation schools (so that they could graduate with the previous graduation requirements if necessary), and for the district to continue to push for universal A-G completion in future years. A final vote on the proposal is scheduled for Dec. 10. *(County/Court schools serve students who are incarcerated, on probation or otherwise involved in the juvenile justice system, as well as students who have been expelled or had other disciplinary issues. The county also maintains Hilltop HS, a school for pregnant or parenting teens. The school district’s continuation high schools serve students who are age 16 and over and severely behind in credits). This entry was posted in Uncategorized and tagged a-g, committee, graduation, recap. Bookmark the permalink.